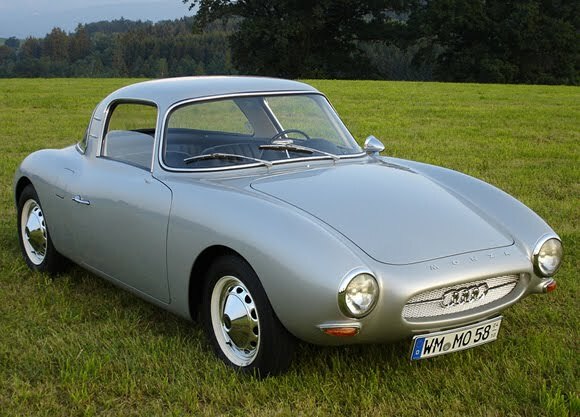 The DKW Monza is a very beautiful car. As you can see from the four rings logo on the front it has an association with Audi. This is because the Monza was built on a Auto Union DKW base that was covered in a glass-fiber reinforced polyester coupe body. Lightweight, 780kg's, and quite small the Monza was quite fast and even set five records at the Monza Circuit in 1956. Power is via a 900cc three cylinder with a massive 40hp. With this the Monza could do 87mph flat out. In fairness a modern golf cart would probably accelerate faster but the golf cart wouldn't sound like this. Excellent. The shame about this car is that in 1957 Audi produced a competitor car and so wouldn't provide the chassis needed to keep the Monza in production. No one seems to have a handle on how many of these cool cars were built but here's a link to pics of a racing one. Check out the engine bay of the silver car in the second row. Beautiful. That IS a lovely and interesting car. I'm used to seeing light sports cars from Italy from this period, but I don't know much about the German efforts (aside from Denzel). Thanks for putting me onto the Denzel Shaun. I will feature one soon.